A stick, a string, and a paper clip are three unrelated things. However, when a kid who was determined to catch a fish put them together, they became a crude fishing pole. He tried and tried, but didn’t catch a fish. I told him that at the next break, I would meet him at the pond because I had some special bait. When I got there, I made a few adjustments to his paperclip, and then put some left-over communion bread on the paperclip. On his first cast, he got a bite. One his second cast, he landed a fish. 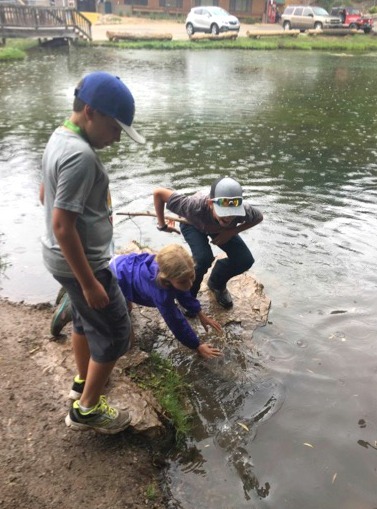 Oh the joy on his face and the joy the other kids experienced when the fish flopped on the bank before flopping back into the pond. After that they all wanted some on my special bait. Several months after camp, I was reflecting on that experience and was reminded of the difference Jesus makes. Three unrelated things became a crude fishing pole, but when Jesus is added- a life was changed. Paul began his letter to the Corinthians by saying “In Christ we have been enriched in every way.” Jesus makes the difference. Sacramento Camp and Conference Center brings many unrelated things together- staff, campers, volunteers, activities, worship, and when Jesus is added, lived are enriched in ways beyond what we can imagine. Preparing meals, cleaning, filing, answering the phones, scheduling activities, shoveling horse manure, working on a sewer line all may seem like routine activities. In some ways they are. However when Jesus is added, those routine things have the potential to change lives. We will never know the full impact of our ministry. We will never know how many lives we’ve touched in a year, but when we keep our focus on Jesus, lives will be enriched. Your labor is not in vain. Thank you to our guest blogger Rev. Monty Leavell, Pastor of Artesia FUMC and Sacramento’s Board Chaplain. This is an amazing story. Thanks for sharing. Thanks for being God’s blessing to this young man.